The event has started, and the guests enter into the venue. So far, things have gone rather well: the guests, many of who are meeting for the first time, are chatting with one another and the evening seems promising. The doors open and everyone is dazzled as they enter the room: there’s good lighting, music, the stage is set and everything looks stunning. Everyone finds their assigned tables, they pull out their seats, sit down … and that’s when the problem becomes apparent. Smack-bang in the middle of the table, exactly at eye-level, is the world’s largest bunch of flowers. Or a candelabra big enough to light-up the entire venue. On the odd occasion, I’ve even seen a towering fish tank that would put the Two Oceans Aquarium Shark Exhibit to shame. The rest of the evening is spent with the guests limited to speaking to those to the immediate left and right, and occasionally you see a head leaning to the side as someone opposite tries to join the conversation. When the speeches and presentations start, people shuffle around trying to at least get a glimpse of the speaker between the vegetation (or the candles or goldfish). If you’re a waiter, or wish to get the attention of everyone at the table, good luck! Inevitably, towards the end of the evening, one person takes the initiative to remove the obstacle … and all the tables follow suit. What was the decor designer thinking? I understand that you’re trying to make the venue look fantastic, but why must this happen to the detriment of the guests’ enjoyment? I suspect the reason is that the decor designer hasn’t actually seen things from the guests’ perspective. As the father of a 2-year-old daughter, the parenting books suggested that once your child starts walking, you need to crawl around your house on your hands and knees. That way, you can see things from your child’s perspective and find potential dangers that would see from an adult-height point of view. Similarly, it’s vital that the event planner imagine what the guests see from their seats. That way, you can avoid plonking a vase containing the entire fynbos family on the table! 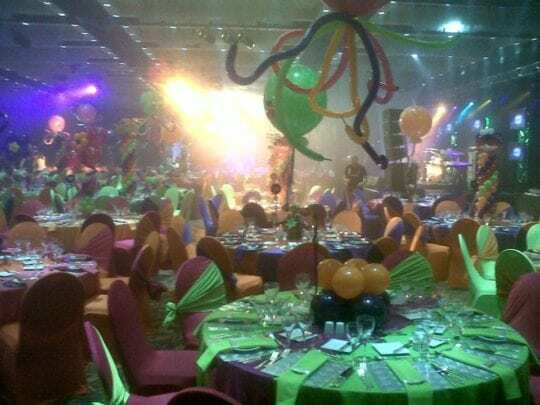 Remember, the success of an event is not defined by how well the theme was displayed, nor by the gourmet food, or the number of fine wines available. The important qualities of a successful event are the connections, relationships and memories created by the guests, through their interaction. You could have the most amazing venue and fantastic food, but if the guests aren’t socializing, it’s all pretty pointless. I’m not for a moment suggesting that a part of the budget shouldn’t be spent on decor and centre-pieces; I’ve seen some amazing decorations that really added a very special touch to the theme and were also great conversation-starters. But when the implementation of the decor detracts from the original purpose of the event – which is to create a comfortable and fun atmosphere so that guests will socialize – then it’s time to put your foot down. Besides being a waste of money (and cruel, when you have a school of guppies floating around in an oversized vase), preventing people from interacting will detract from the overall experience that you want people remember. An event is an opportunity for people to meet, connect and create relationships. It’s not the time to demonstrate your abilities to place a Chelsea Flower Show exhibit on the middle of a table! Of course, I’m exaggerating, but you’d be surprised how frequently I’m eventually forced to pick up the centre-piece and place it next to the table – just so that I can get eye-contact with everyone. As beautiful and elegant as the centre-piece is, once I’ve removed it from the middle of the table, it’s never put back. So the next time you’re working on the decor of your event, consider the practicalities from your guests’ perspective and make the table decorations no higher than about 30cm. Alternatively, provide a machete to each guest to “interact with the decor” and slash the table flora to a manageable level. Previous:What should you expect from a professional entertainer?